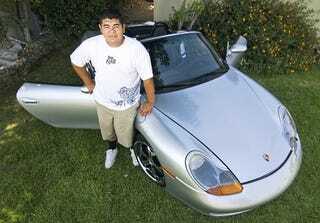 Starting with an old cell phone a friend gave him, 17-year-old Steven Ortiz of Glendora, CA, used Craigslist to trade up 14 times over two years and eventually end up with a Porsche Boxster. Here's how he did it. Click to viewAlthough Oritz's story isn't the first time we've seen Craigslist-swapping writ large, it's the first one we've seen that doesn't include any outside help. You may remember Kyle MacDonald, who famously created a website to document his attempt to trade one red paperclip for a house. It worked. But MacDonald also had a built-in fanbase and publicity from his website. Ortiz, a 17-year-old high-schooler, had no such help. Instead, he spent the better part of two years tied to his iPhone, skimming Craigslist and carefully picking out trades he knew he could benefit from. Starting with an old cell phone that was given to him for free by a friend, Steven used the "barter" section of Craigslist to move up to a better phone. He then traded the phone for an iPod Touch, the iPod Touch for a dirtbike — which was turned around several times for other, better dirtbikes — and then a MacBook Pro arrived, which opened the door to vehicles. The MacBook Pro was traded for a Toyota 4Runner, which was then bartered for a custom off-road golf cart. Keep in mind that Steven was only 15 at the time, so even if he'd kept that 4Runner, he couldn't drive it anywhere. The golf cart was then traded for a much more expensive dirt bike, the dirt bike was traded for a street bike, and then Steven traded that for a series of boring cars, ending up with a sweet 1975 Ford Bronco. Had we been Steven, we'd probably have stopped there, as it doesn't get much better than an old Ford Bronco. However, by the time he acquired the Bronco he was of driving age. After enjoying it for a while, he decided to mix things up and go for a Porsche. It was actually a trade down, one that we can't really fault him for — everyone needs to own a Porsche at least once in their life. The Bronco was probably worth more than the $9000 asking price on the 2000 Boxster, but it'll probably pay dividends in the halls of his high school. The total number of trade transactions between old cell phone and Porsche Boxster? Fourteen. Reality is setting in, however, and the obnoxious maintenance costs that go along with owning a Porsche are making the car hard to live with. Naturally, Steven is turning his eye is toward a new car. He's thinking about a Cadillac Escalade.